On the threshold of Neo-classicism, a new style characterised by symmetry, regularity and order, Spain saw the final flourishing of the Baroque. Its free approach and elaborate, sumptuous nature had little to do with the manifestation of that style that had prevailed in the 17th century, with its sinuous but controlled forms. Late Spanish Baroque, which continued in use for much of the first half of the 18th century, was an excessive type of art. Characteristic examples include the altarpieces and other works generally termed churriguerescas, which make use of a wealth of Salomonic columns covered in grapes and vine tendrils and a large number of figures and decorative motifs, leaving no point of rest for the eye. 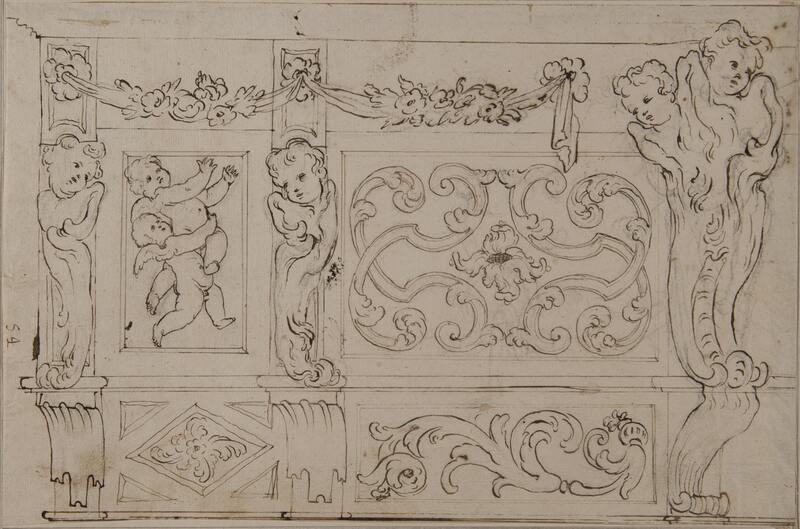 Others, such as the present drawing, fall more within the European Rococo style due to the profusion of rocailles (the word from which the term Rococo derives), a notable horror vacui and a proliferation of purely decorative motifs. Within this style associated with the European Rococo, one figure in Spain stands out from the rest: the architect and sculptor Narciso Tomé. He remains one of the most enigmatic figures in Spanish art due to the fact that nothing is known of his training and possible contacts in Europe. 1 The scant available information on Tomé indicates that he was born in the city of Toro (Zamora) around 1694. Son of the sculptor and joiner Antonio Tomé, he must have learned these skills from his father, as did his brothers Andrés and Diego, with whom he founded a type of company that worked in the areas around the province of Zamora. Their fame gradually grew and in 1715 they were commissioned to produce a new entrance door for the University of Valladolid. It remains a mystery as to how a family of wood sculptors masterfully sculpted a marble doorway, but the success of this project brought them praise and recognition in Spain. 2 As a result, in 1721 Narciso Tomé was appointed Head of Works at Toledo cathedral, replacing Teodoro Ardemans who had held the post since 1691 but who had fallen ill. Tomé accepted the commission to work on the project for the retro-choir of the cathedral, which the Chapter had long had in mind. After just three months, in June 1721 he presented his designs for this work, which were approved with unanimous satisfaction. 3 The most striking of them is for the Transparente, a break in the wall of the apse designed to allow light to fall on the tabernacle. It is conceived in terms of a two-storey altarpiece, with an oculus between the two levels that symbolises the sun with its bronze rays surrounded by figures. As a whole, the design is an apotheosis of forms in movement, finely sculpted marbles and jaspers, and gilt bronzes with narrative reliefs. Most striking, however, is the large number of angels in the most varied range of poses, many of them solely consisting of a winged head with the body suggested by a rocaille. These smiling, chubby, playful and gentle beings present an entire repertoire of expressions and poses, all sculpted with the greatest technical mastery. Comparable heads of small angels with rocaille bodies are to be seen in the present drawing. They also appear in other drawings by Tomé including the Project for the Altarpiece in the Chapel of San Ildefonso in Toledo Cathedral (Madrid, Biblioteca Nacional, inv. no. DIB/18/1/7196) and one for an Altarpiece of Saint Benedict (Madrid, Biblioteca Nacional, inv. no. DIB/14/45/75). On the numerous issues relating to this artist and his possible training, see: Chueca Goitia, Fernando, “Narciso Tomé: una incógnita del barroco español” in Goya, no. 49, 1962, pp. 12-21; and Prados García, José María, Los Tomé. Una familia de artistas españoles del siglo XVIII. Madrid, Universidad Complutense de Madrid, 1991. Nicolau Castro, Juan, Narciso Tomé: arquitecto y escultor, 1694-1742. Colección Ars Hispánica. Madrid, Arco Libros, 2009, pp. 21-25. 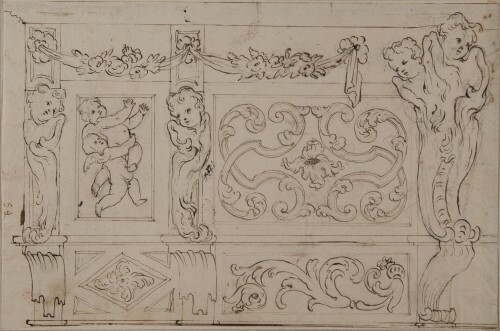 Prados García, José María, “Las trazas del Transparente y otros dibujos de Narciso Tomé para la catedral de Toledo” in Archivo Español de Arte, no. 196, 1976, pp. 387-416. Castañeda, Francisco Xavier, Relación de los solemnes aparatos, magníficos afectuosos festejos, y aclamaciones festivas con que en la Imperial Ciudad de Toledo… se celebró la colocación de Christo Sacramentado… a el nuevo magnífico Transparente… Toledo, 1732, 4v. A few years later, with the onset of the Enlightenment, Tomé became the subject of extremely hostile criticism rather than effusive praise. Among his critics was Ceán Bermúdez, who accused him of ignorance, of not adhering to any rule or precept of art and of provoking astonishment with his “follies inflicted on this realm”. He considered him “a blind follower of the absurdities of Borromini, Ribera and Churriguera”. Ceán Bermúdez, José Agustín, Diccionario histórico de los más ilustres profesores de las Bellas Artes en España. Madrid, Imprenta de la Viuda de Ibarra, 1800, vol. V, p. 53.